José Abad Santos, Vicente Lim, Josefa Llanes Escoda. Denomination 1000. On banknote are José Abad Santos, Vicente Lim and Josefa Llanes Escoda. 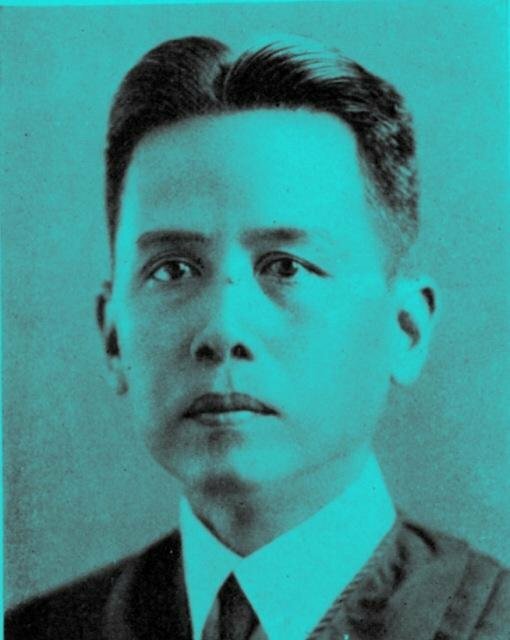 José Abad Santos (February 19, 1886 – May 7, 1942) was the fifth Chief Justice of the Supreme Court of the Philippines. He briefly served as the Acting President of the Commonwealth of the Philippines and Acting Commander-in-Chief of the Armed Forces of the Philippines during World War II, on behalf of President Quezon after the government went in exile to the United States. After about two months, he was executed by the Japanese forces for refusing to cooperate during their occupation of the country. Josefa Llanes Escoda (September 20, 1898 – January 6, 1945) was a prominent civic leader, social worker and Filipina war heroine. 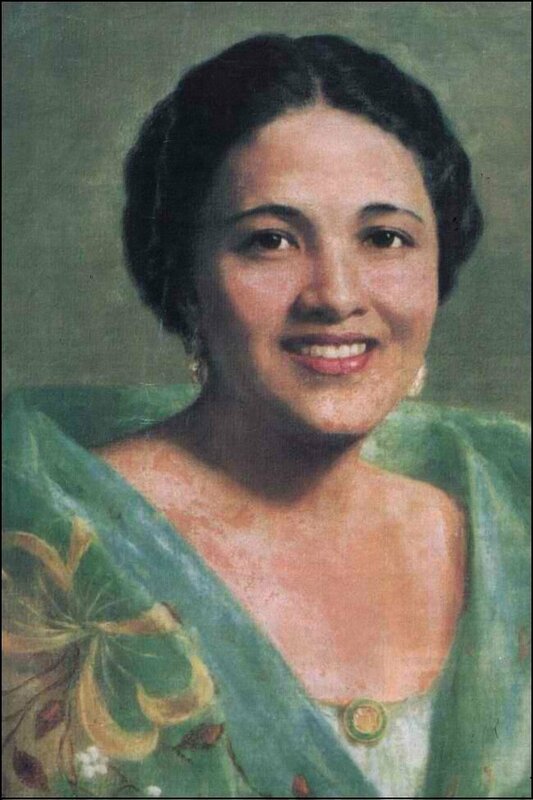 She is well known as a Filipino advocate of women's right of suffrage and was founder of the Girl Scouts of the Philippines. Together with José Abad Santos and Vicente Lim, she is memorialized on the Philippines' 1,000-Peso banknote depicting Filipinos who fought and died resisting the Japanese occupation of the Philippines during the Second World War. Vicente Podico Lim (February 24, 1888 – December 31, 1944) was a Filipino Brigadier General and hero during World War II. 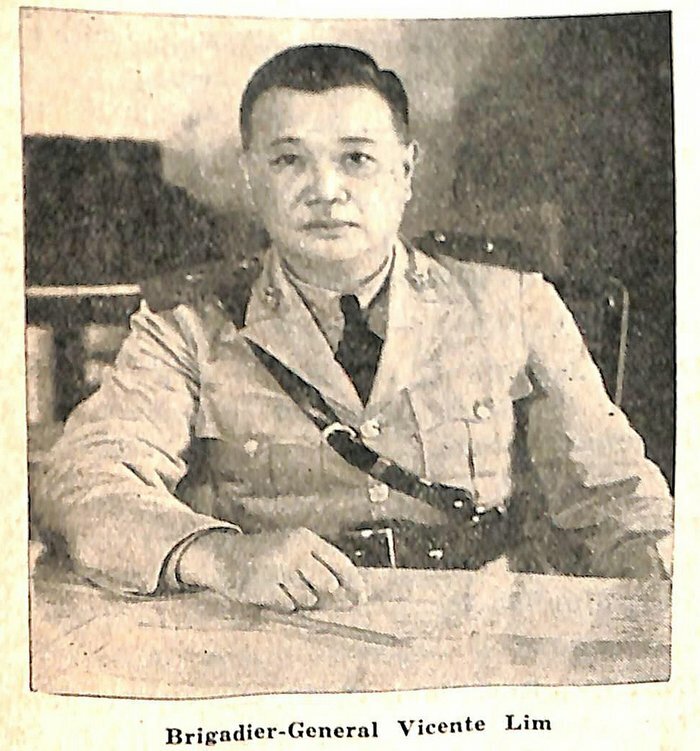 Lim was the first Filipino graduate of the United States Military Academy at West Point (Class of 1914). Prior to the establishment of the Philippine Army, he served as an officer in the Philippine Scouts (a now-defunct component of the US Army). During the Battle of Bataan, Lim was the Commanding General of the 41st Infantry Division, Philippine Army (USAFFE). After the fall of the Philippines he contributed to the Filipino resistance movement until he was captured and subsequently executed. Lim was one of the seven Charter Members of the Boy Scouts of the Philippines. He is memorialized in the Philippines' 1,000-Peso banknote together with two other Filipino heroes who fought and died against the Japanese during the Second World War. The seal of Central Bank of Philippines is right of center. The coat of arms of Philippines is centered. 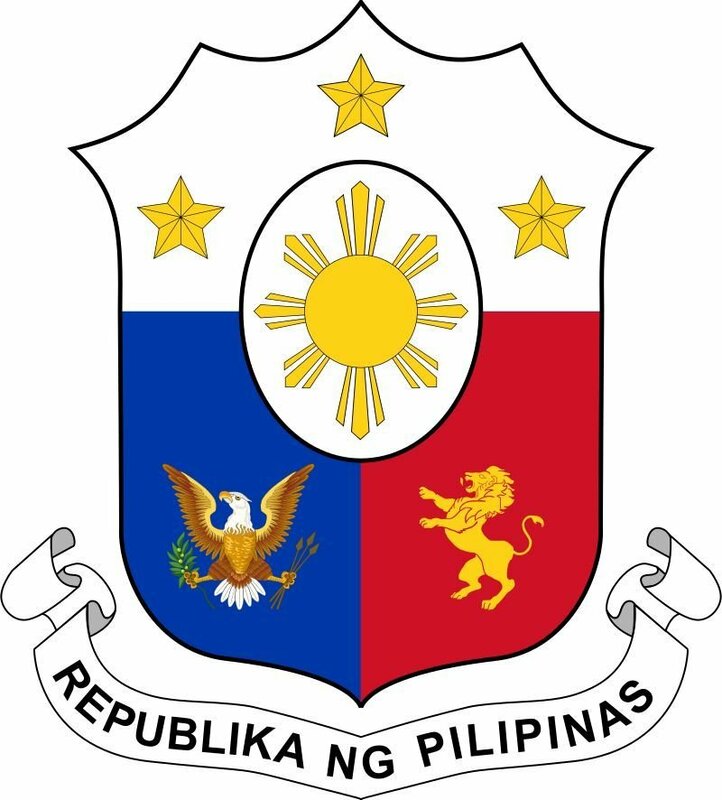 The Coat of arms of the Philippines (Filipino: Sagisag ng Pilipinas) or sometimes in (Spanish: Escudo de Filipinas) features the eight-rayed sun of the Philippines with each ray representing the eight provinces (Batangas, Bulacan, Cavite, Manila, Laguna, Nueva Ecija, Pampanga and Tarlac) which were placed under martial law by Governor-General Ramón Blanco during the Philippine Revolution, and the three five-pointed stars representing the three primary geographic regions of Luzon, Visayas, and Mindanao. On the blue field on the dexter side is the North American bald eagle of the United States, and on the red field on the sinister side is the lion rampant of the coat of arms of the Kingdom of León of Spain, both representing the country's colonial past. The current arms, which shares many features of the national flag, was designed by Filipino artist and heraldist Captain Galo B. Ocampo. 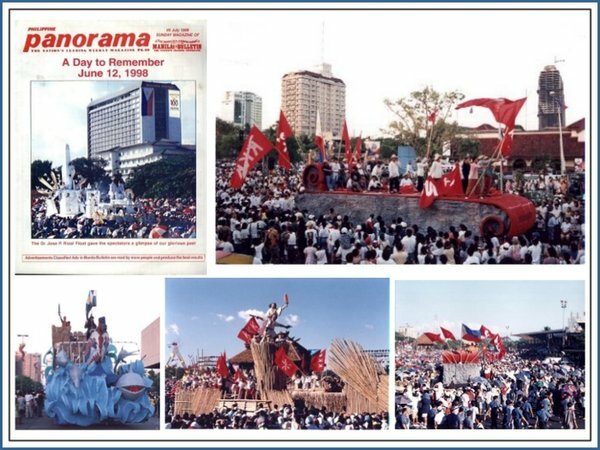 In lower left corner is The Philippine Centennial Celebration, 12 June 1998. 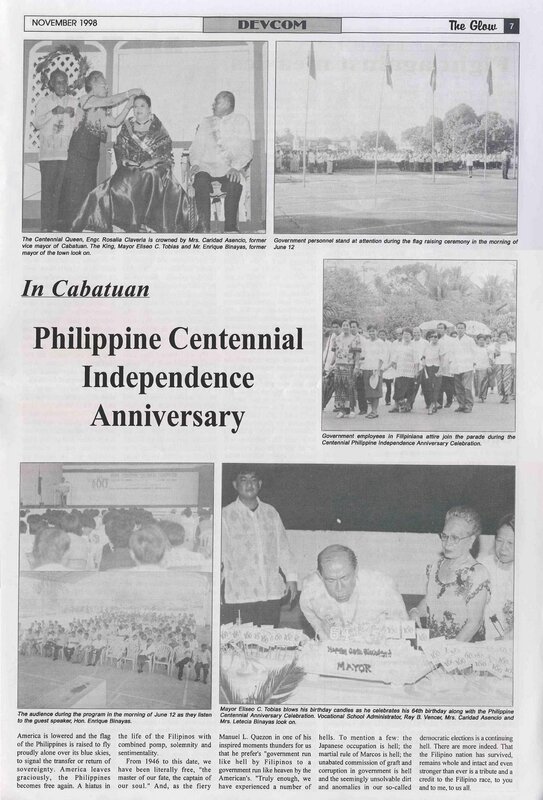 In 1998 was the 100th anniversary of the Philippine independence. It was on June 12, 1898, when General Emilio Aguinaldo, first president of the Philippine republic, declared the independence of the country from the Spanish rule , at his residence in Kawit, Cavite. Aguinaldo's action, however, was just the culmination of a series of events in what is now known as the "Philippine Revolution of 1896," which was launched after the execution of Dr. Jose Rizal in Bagumbayan on December 30 of the same year. At the bottom, centered - despite, that on banknote noticed, that the image of Order in "Medal of Honor", on banknote is The Order of Lakandula (Filipino: Orden ni Lakandula). The Order of Lakandula (Filipino: Orden ni Lakandula) is one of the highest honors given by the Republic of the Philippines. 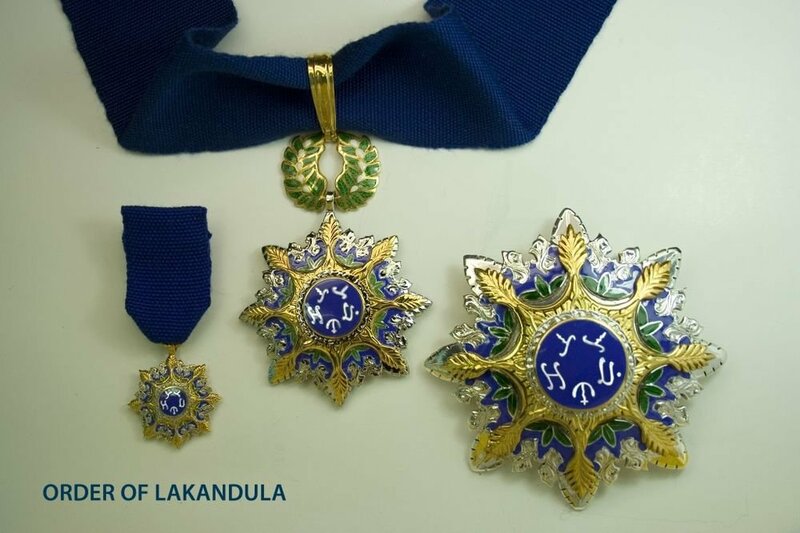 It is an order of political and civic merit, awarded in memory of Lakandula’s dedication to the responsibilities of leadership, prudence, fortitude, courage and resolve in the service of one’s people. a. who has demonstrated by his life and deeds a dedication to the welfare of society; b. whose life is worthy of emulation by the Filipino people; c. for deeds worthy of particular recognition, including suffering materially for the preservation and defense of the democratic way of life and of the territorial integrity of the Republic of the Philippines, for devoting his life to the peaceful resolution of conflict, or for demonstrating an outstanding dedication to the fostering of mutual understanding, cultural exchange, justice and dignified relations among individuals; or d. for acts that have been traditionally recognized by the institution of presidential awards, including meritorious political and civic service”. In the foiled window, the image of the reverse is repeated - the Pinctada maxima oyster with a white pearl. Denominations in numerals are in top left and lower right corners. In words lower, centered. 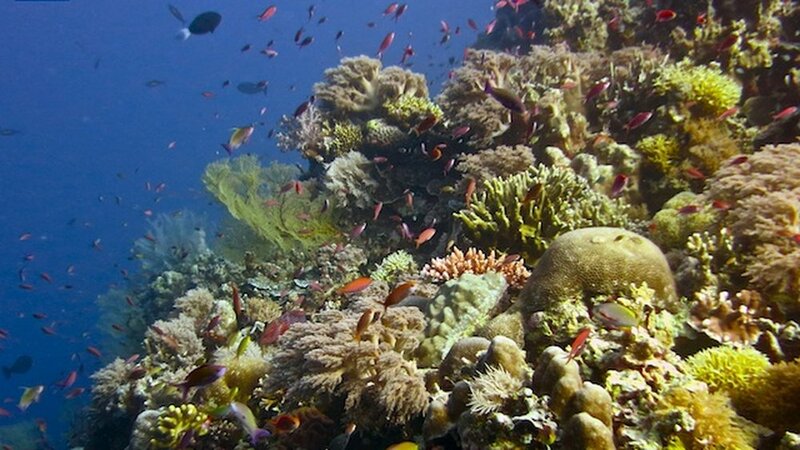 1) Tubbataha Reefs Natural Park. 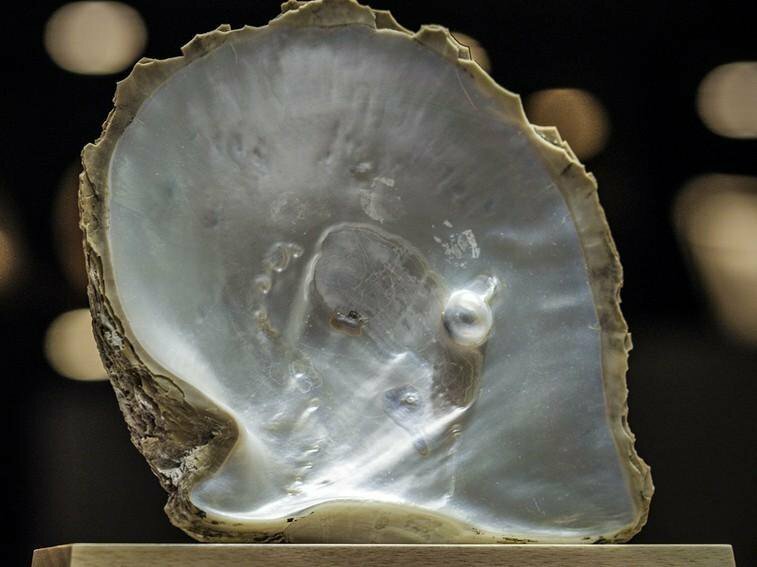 2) The Pinctada maxima oyster with a white pearl. 3) Mindanao design for Tinalak (Ikat-dyed abaca). 4) Map of the Philippines with a marked Tubbataha Reef. 5) The red lionfish (Pterois volitans). 6) The green sea turtle (Chelonia mydas). The Tubbataha Natural Park also known as Tubbataha Reefs Natural Park (Filipino: Bahurang Tubbataha) is a protected area of the Philippines located in the middle of the Sulu Sea. The marine and bird sanctuary consists of two huge atolls (named the North Atoll and South Atoll) and the smaller Jessie Beazley Reef covering a total area of 97,030 hectares (239,800 acres; 374.6 sq mi.). It is located 150 kilometers (93 mi.) southeast of Puerto Princesa City, the capital of Palawan province. The uninhabited islands and reefs are part of the island municipality of Cagayancillo, Palawan, located roughly 130 kilometers (81 mi.) to the northeast of the reef. In December 1993, the UNESCO declared the Tubbataha Reefs National Park as a World Heritage Site as a unique example of an atoll reef with a very high density of marine species; the North Islet serving as a nesting site for birds and marine turtles. The site is an excellent example of a pristine coral reef with a spectacular 100-m perpendicular wall, extensive lagoons and two coral islands. In 1999, Ramsar listed Tubbataha as one of the Wetlands of International Importance. In 2008, the reef was nominated at the New 7 Wonders of Nature. The national park and the rest of the Philippine archipelago is part of the Coral Triangle, recognized as a center of marine biodiversity containing 75% of the described coral species and 40% of the world's reef fish. The area is under a grave threat due to overfishing and destructive fishing practices. Research of scientists visiting the reefs since the 1980s revealed that the Tubbataha Reefs Natural Park contains no less than 600 fish species, 360 coral species, 11 shark species, 13 dolphin and whale species, and 100 bird species. The reefs also serve as a nesting ground for Hawksbill and Green sea turtles. Pinctada maxima, with white pearl. Pinctada is a genus of saltwater oysters, marine bivalve mollusks in the family Pteriidae, the pearl oysters. These oysters have a strong inner shell layer composed of nacre, also known as "mother of pearl". Pearl oysters are not closely related to either the edible oysters of family Ostreidae or the freshwater pearl mussels of the families Unionidae and Margaritiferidae. P. margaritifera and P. maxima are used for culturing South Sea and Tahitian pearls. They are cultured widely primarily in the central and eastern Indo-Pacific. A pearl oyster can be seen on the reverse side of the 1,000-peso bill of the Philippines. On right side is the red lionfish. 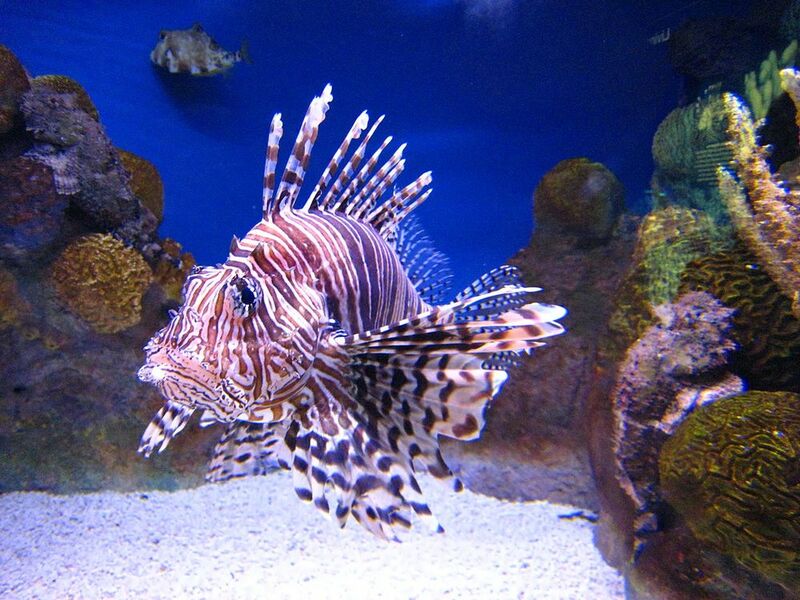 The red lionfish (Pterois volitans) is a venomous, coral reef fish in the family Scorpaenidae, order Scorpaeniformes. P. volitans is natively found in the Indo-Pacific region, but has become an invasive problem in the Caribbean Sea, as well as along the East Coast of the United States. This and a similar species, Pterois miles, have both been deemed as invasive species. 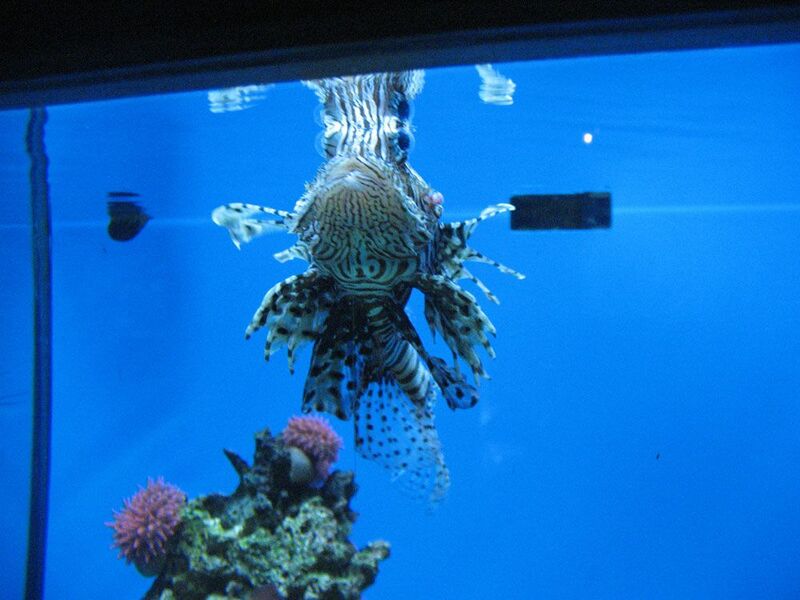 Red lionfish are clad in white stripes alternated with red/maroon/brown stripes. Adults in this species can grow as large as 47 cm. (18.5 in.) in length, while juveniles are typically shorter than 1 inch (2.5 cm.). The average red lionfish lives around 10 years. As with many species within the Scopaenidae family, it has large, venomous spines that protrude from the body, similar to a mane, giving it the common name lionfish. The venomous spines make the fish inedible or deter most potential predators. Lionfish reproduce monthly and are able to quickly disperse during their larval stage for expansion of their invasive region. No definitive predators of the lionfish are known, and many organizations are promoting the harvest and consumption of lionfish in efforts to prevent further increases in the already high population densities. Pterois volitans is native to the Indo-Pacific region, including the western and central Pacific and off the coast of western Australia. However, the species has been accidentally introduced into the Western Atlantic and has become an invasive species there. Centered, above is The green sea turtle (Chelonia mydas). 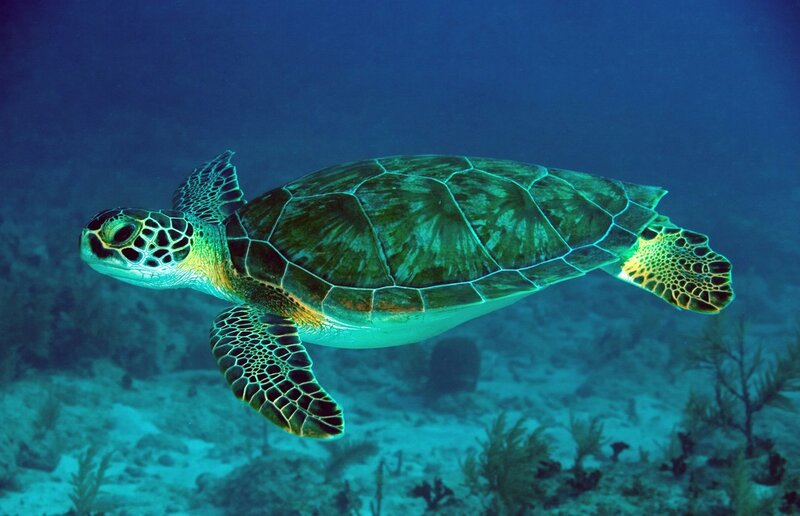 The green sea turtle (Chelonia mydas), also known as the green turtle, black (sea) turtle or Pacific green turtle, is a large sea turtle of the family Cheloniidae. It is the only species in the genus Chelonia. Its range extends throughout tropical and subtropical seas around the world, with two distinct populations in the Atlantic and Pacific Oceans, but it is also found in the Indian Ocean. The common name comes from the usually green fat found beneath its carapace; these turtles' shells are olive to black. This sea turtle's dorsoventrally flattened body is covered by a large, teardrop-shaped carapace; it has a pair of large, paddle-like flippers. It is usually lightly colored, although in the eastern Pacific populations parts of the carapace can be almost black. Unlike other members of its family, such as the hawksbill sea turtle, C. mydas is mostly herbivorous. The adults usually inhabit shallow lagoons, feeding mostly on various species of seagrasses. The turtles bite off the tips of the blades of seagrass, which keeps the grass healthy. Like other sea turtles, green sea turtles migrate long distances between feeding grounds and hatching beaches. Many islands worldwide are known as Turtle Island due to green sea turtles nesting on their beaches. Females crawl out on beaches, dig nests and lay eggs during the night. Later, hatchlings emerge and scramble into the water. Those that reach maturity may live to 80 years in the wild. C. mydas is listed as endangered by the IUCN and CITES and is protected from exploitation in most countries. It is illegal to collect, harm or kill them. In addition, many countries have laws and ordinances to protect nesting areas. However, turtles are still in danger due to human activity. In some countries, turtles and their eggs are hunted for food. Pollution indirectly harms turtles at both population and individual scales, as well as light pollution. Many turtles die after being caught in fishing nets. Also, real estate development often causes habitat loss by eliminating nesting beaches. 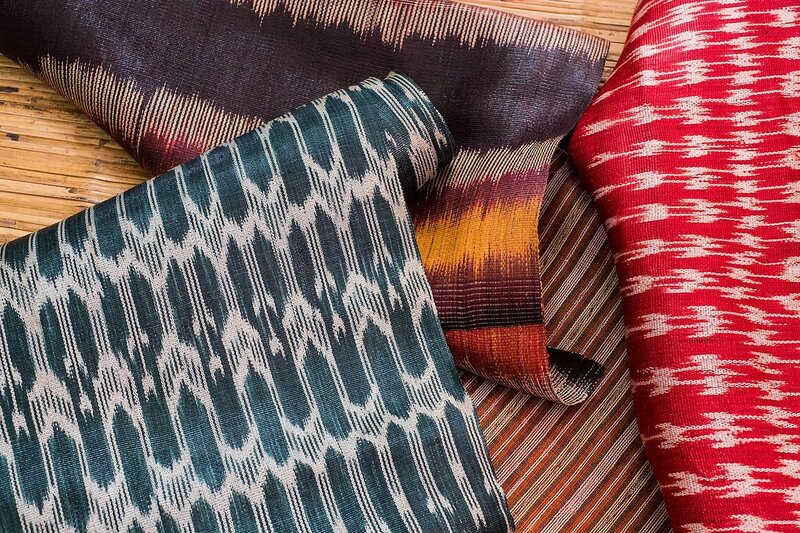 On right side is Mindanao design for Tinalak (Ikat-dyed abaca). T'nalak (also spelled tinalak), is a weaving tradition of the T'boli people of South Cotabato, Philippines. T'nalak cloth are woven from abacá fibers. The traditional female weavers are known as dream weavers, because the pattern of the t'nalak cloth are inspired by their dreams. T'nalak is a traditional cloth found in Mindanao island made by a group of people in Lake Sebu, South Cotabato called T'bolis, Tboli people. This traditional cloth is hand-woven made of Abaca fibers which traditionally has three primary colors, red, black and the original color of the Abaca leaves. The colorant of the materials are naturally dyed boiled in with bark, roots and leaves of plants. It is an heritage and believed that the intricate and creative patterns of the Tinalak was seen on their dreams and made it on to work. They can't create a design of the Tinalak if they haven't dreamed of it. They are sometimes called the "Dream Weavers". The T’nalak fabric holds a special and prominent place in [T’boli] culture. It is ever present in significant turning points in a [Tboli] life, such as birth, marriage, and death. It is the medium which sanctifies these rites, enveloping them in the length of its fabric like a benediction. It has also often been referred to as “woven dreams”. It is exactly that, and more. In a culture which didn’t have a form of writing, the T’nalak served as both Literature and Art. The [T’bolis] expressed everything they are in the T’nalak: their dreams, beliefs, myths and even their religion. Making use of the various geometrical patterns and the trademark red, black and white colors, the [T’bolis] weave the natural and the supernatural in the abaca strands of the T’nalak. Furthermore, the weaving process integrates the personal, the social and the cultural. After a weaver reaches a certain degree of expertise, she becomes a “master weaver” – someone who can interpret and take inspiration from dreams, hence the term “dreamweavers”. By all accounts, this seems to be an intense personal experience for the weaver, and the moment she succeeds in doing this is the moment she becomes an artist. And then it is also social because the T’nalak binds together all that the [T’boli]people believe in. The skill of the weaver gathers in the T’nalak all the elements that make the [T’boli] social life. Finally, it is cultural in that it is the means through which other tribes identify the [T’bolis] since the T’nalak is uniquely and distinctly [T’boli]. Tinalak are also their prized possession at marriage, even the covering for childbirth for ensuring safe delivery and for trading. Whenever they sell their work, they put a brass ring around it as for the spirits to allow them or to please. They're not even allowed to cut the Tinalak 'cause of what they believe it would deliver them sickness. Denominations in numerals are in top corners. In words centered, at bottom.